Here’s some good stuff from some cool places around town. What does hibiscus taste like? I didn’t know, and still don’t really know how to describe it even after drinking this three times a week for the last month. All I’ll say is this: Your tea comes in a pleasing magenta hue and has a vague cinnamon note. As your brain gropes for the proper way to characterize the flavor, your mouth begs for more. Just keep drinking. Hooked on Colfax is awesome because the building is old as hell, slings a killer vibe, has lots of free parking around it, and contains a basement that smells like your grandparents’ house (this is a good thing). Sure enough, I sat down to work after my haircut and eyebanged the Popsters for two hours before caving and buying two of them for me and the wife. They’re absurdly good. The pastry is flaky, the filling rich and delicious, and the guilt of plying yourself with simple carbohydrates and refined sugar is non-existent because you’re JUST SO HAPPY you’re eating them. That’s right – no guilt because these things are so tasty they’re worth the extra miles on your next run and skipping your evening craft beer. Quality! Marble rye, roasted sweet potato slices, spinach, and creamy goat cheese. While driving around one day searching for a proper lunch spot, I happened upon this place, got this sandwich, and spent my afternoon happy. Then I spent my afternoon happier when I ordered an IPA to accompany it. Small points off the sandwich for its unnecessary inclusion of raw red onion. 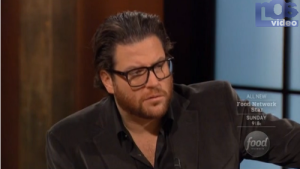 Scott Conant disapproves of your inclusion of raw red onion. Also, sitting in this café and gazing out the window reminds you of how weird and awful the Capitol Hill neighborhood can be. People who are high as balls shamble about to and fro while self-important political people flit around pretending to be more vital to the democratic process than they likely are. Also, traffic. I normally abhor coconut mostly for its texture. The flavor is fine, if a bit too reminiscent of suntan lotion, but the texture of shaved coconut makes me feel like someone dumped a bunch of wood shavings from the bottom of a guinea pig cage into whatever I’m eating. But I’ve now drank enough green tea to realize most flavor injections are welcome. Some green tea tastes like the barista steeped the contents of a lawnmower bag in hot rainwater and then served it to you with a disarming smile. The coconut green tea at Denver Bicycle Café pleases the palate with crisp refreshment offset slightly by the earthy, toasty coconut note. I can (and sometimes do) drink these for hours on end. I should also note how amazing the Denver Bicycle Café is in the summer morning. The doors open wide to a quaint patio while a fresh breeze gently wafts over your face making work feel surprisingly relaxing and enjoyable. This is my hood, so you gotta give some love to your hometown place! Started by a CSU alum, you’ll frequently see the Denver Cupcake Truck (operated out of Cake Crumbs) at CSU rallies handing out free green & gold cupcakes to the faithful. Seriously, all of these cupcakes are insanely good, and if forced to make a firm recommendation, I suppose I’d have to choose their Red Velvets. Thumbs up for cream cheese icing! Sidenote: You’ve probably been eating cupcakes wrong your whole life. Here’s a lesson in how to do it right. I’ve saved my favorite for last. Full disclosure: My good buddy Bird owns this place, and also served as one of the very first guests on the Jon of All Trades Podcast. That said, I thoroughly adore this place. The music is loud, Bird will introduce you to the person next to you and force you to strike up a conversation with them, and the cops in this neighborhood are a bit draconian about the parking. So, be warned if any of that will affect your productivity. I tend to get more done here than anywhere else, for whatever that’s worth. I make it a point to get a Wrigley at least once a week. It’s a mixed green salad with grilled chicken, goat cheese crumbles, dried cranberries and candied walnuts served with a strawberry avocado vinaigrette. The dressing is the piece de resistance here as it’s at once silky, tangy, tart and creamy. The elements of this salad work together like James Brown’s band “The J.B.’s” on their best nights. All the flavors are here and they’re gorgeous together. I’m out and about basically everyday now, so if you’re reading this and think, “Hey, I could go for a hibiscus tea!” hit me up, and let’s chat. See you around! I love this! I agree that the poptarts are ridiculous and I avoid them like the plague or I will 9. Great stuff ! I actually laughed out loud and now I’m headed out for a coconut green tea! Thanks for the tip!